From the 1940s through the late 1970s, rabbits were used to screen products such as pharmaceuticals for the presence of pyrogenic substances like endotoxin. The discovery of the horseshoe crabs’ immunological system, including the amebocyte blood cell and the blood clotting factors contained within, changed the way products were tested for endotoxin. The blood of the horseshoe crab is blue due to the copper-based oxygen carrying protein hemocyanin (see image). 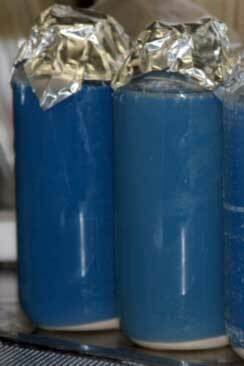 The amebocytes can be seen as the white pellet at the bottom of the blue liquid in the bottles. The blood clotting system contains a cascade (see image) of three inactive enzymes and a clottable protein, coagulogen. In the presence of endotoxin, the first enzyme, Factor C is activated which activates Factor B. 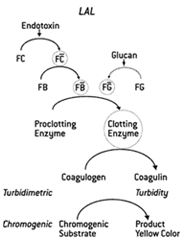 Factor B activates the clotting enzyme which cleaves coagulogen into coagulin. Coagulin molecules stick together to form a clot to protect the horseshoe crab from an exposure to Gram-negative bacteria or endotoxin. Frederik Bang and Jack Levin’s test uses the blood clotting system to form a gel clot in a test tube when endotoxoin is present in the test sample. In 1977, the U.S. Food and Drug Administration allowed for the use of LAL as a replacement for the rabbit pyrogen test for detecting endotoxin in pharmaceuticals and medical devices (see An LAL Timeline for more). In the US it is still a requirement for a new drug to be tested in rabbits at least once before approval just to be sure there is not some inherent non-endotoxin pyrogen present. This test now has worldwide acceptance either as LAL from the Limulus polyphemus or TAL from Tachypleus tridentatus.